With our first (and hopefully the only) born entering his terrible twos, our travel seems to have hit a natural low. For the first time, we have gone a full year without updating our travel page. This could have easily continued for a year or two if not for our decision to move our base from the US to back home in India. I wouldn't go into the reasons and details of this decision as it doesn't belong in here. I just brought it up to explain the seemingly inane decision to go on a 10 day trip to Central America with a hyper-active two year old. Only the thought of never being able to put another trip in this continent for a while could drag us into a plane with our child. After strategically breaking our journey midway in Houston (to ensure that we keep the flying time close to his nap time), we reached Guatemala City (reasonably) incident free on a balmy December afternoon. All normal tourists make a beeline to Antigua (an hour or so taxi drive away) as soon as they land at the capital. We decided to stay for a day in the noisy capital to avoid getting on a long taxi ride after a long flight (which would have been quite damaging on our nerves so early on in the trip) and to check out its city museums - thankfully, our decision turned out to be the right one. 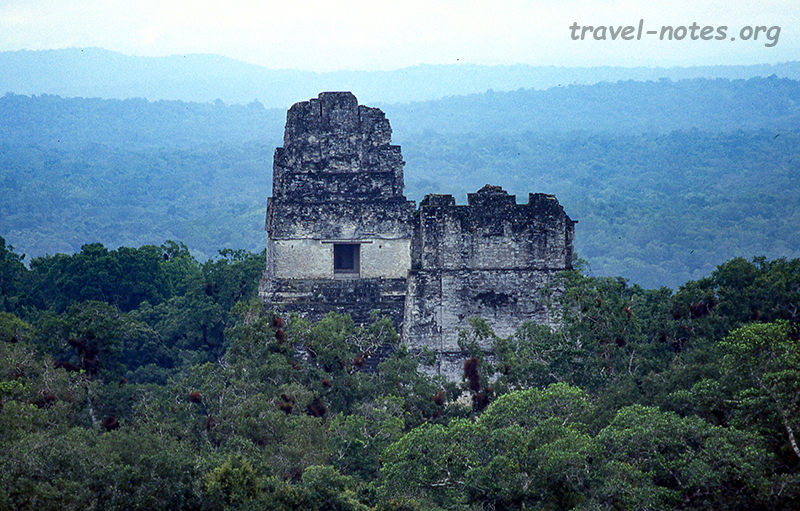 The twin museums of Ixchel and Popol Vuh are quite small, but they more than make it up by their location, organisation and display. The former has good textile collection from various parts of the country while the latter has pottery and ceramics from various epochs of the country's history. The city's best museum is however itsMuseo Nacional de Arqueologia y Etnologia which houses some stunning stelae from the nation's premier Mayan sites - Naranjo, Dos Pilas, Tikal, Piedras Negras etc. A quick one hour taxi drive brought us to Antigua where we spent the next three days of our trip. Antigua used to be the capital of Guatemala till a series of earthquakes broke the Spanish resolve and a decision to move the capital to current location was taken. 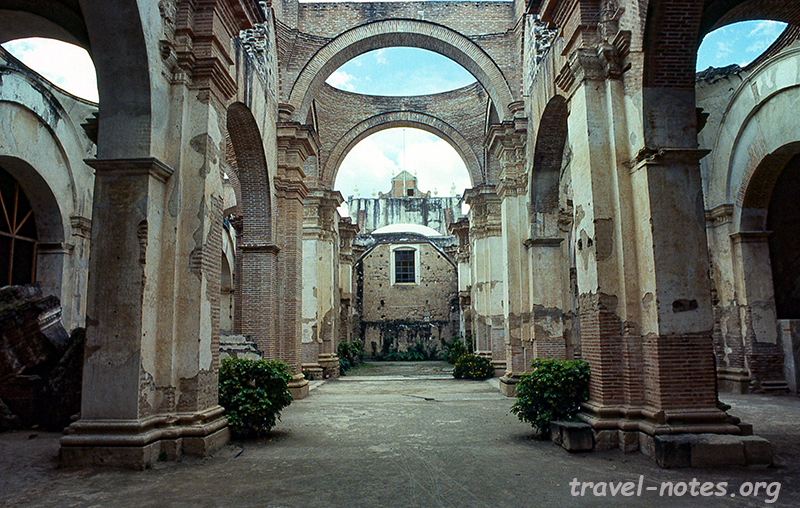 Antigua used to be the religious capital of Central America (probably, the entire Latin America), housing 36 churches and 4 monasteries within a few kilometers. Almost all of them are in ruins, thanks to the earthquakes and the Spanish decision not to re-build them in order to force the people to migrate out of this city. With three days to spare here, we had time to visit all the ruins, but only the best ones stuck in our memory. They include the Capuchin Monastery with its unique circular dorms for the nuns, San Francisco monastery with its stunning view of the volcanoes in the background, the Cathedral for its sheer size and the ruins of Santa Clara. 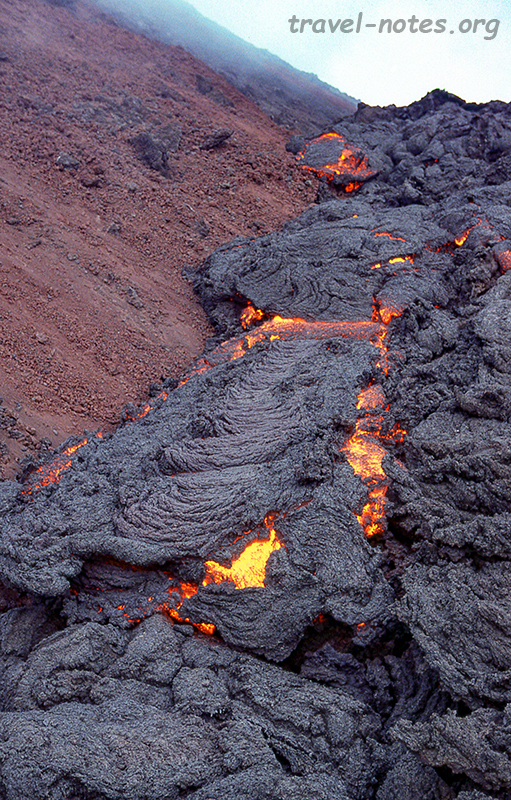 An hour away from Antigua is Pacaya, one of the most active volcanoes in the world. My wife was kind enough to let me go visit it on my own - the visit involves a hour and half brutal climb and hence impossible with a toddler. I haven't done anything serious after our hike-a-thon in Canada and it showed on my volcano climb. I only made it about three-fourths the way and what looked like a mule carried me rest of the way. But our (mine and the mule's) effort was worth it - seeing lava tumbling down the slopes of the volcano was quite an extraordinary experience. The next stop on the trip was Lake Atitlan, tipped to be the prettiest lake on earth (because Huxley apparently said so in one of his writings). 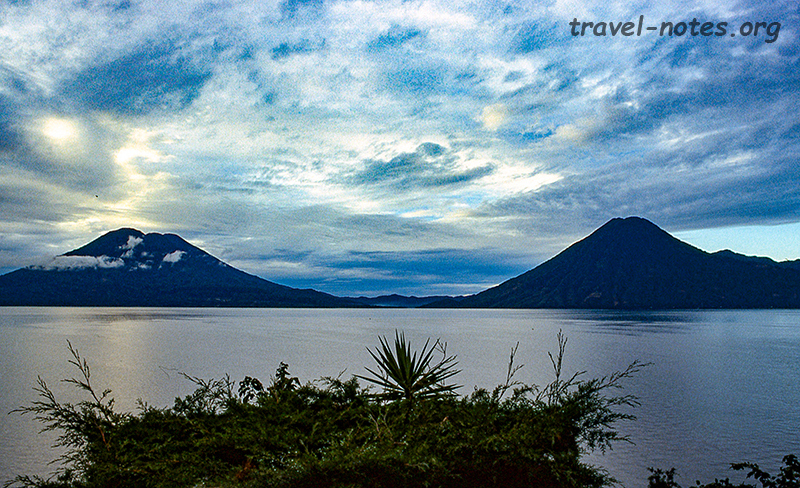 To avoid hiking around the lake with a baby, I had booked our stay in the "Casa del Mundo", a hotel perched high up on a cliff overlooking the lake with a great view of all the three volcanoes that ring the lake - pretty much the best view anyone could get if they hiked around the lake. The only trouble was the trip from Antigua to our hotel involved a three hour taxi ride followed by an half an hour boat ride. The final half hour of the taxi ride was tortuously winding and our motion sick baby made a mess of our surroundings. But we did have a day to recover from the ordeal and we spent most of the following day sitting in our balcony enjoying the best lake view on the planet. Unfortunately, most of the day was overcast and raining and we only got pockets of sunshine to verify the veracity of Huxley's claims. Even under the gloomiest of circumstances, the lake is indeed quite beautiful and as soon as we go through the rest of 3.25 billion lakes on the planet, we will give our verdict. For now it shares the top spot (with Crater Lake) in our list of lakes that we visited so far. Our return trip to Guatemala City from Atitlan was less eventful as the treacherous parts come at the beginning of the trip when the baby sleeps the deepest. 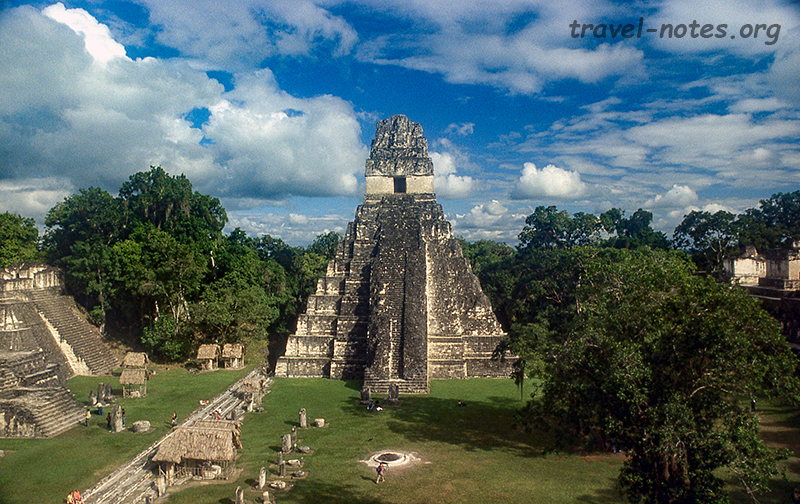 We caught a flight the same evening to Flores and drove an hour to reach Tikal, the most famous of all Mayan ruins (and the reason why we decided to come to Guatemala in the first place). The main plaza with its two pyramids is quite unique in Mayan world and the view from top of the Templo IV is absolutely heart stopping especially if you can make it up here in morning or evening (i.e. before or after the tourist crowd). The site is very extensive and outside of the main plaza it is quite secluded even during the peak hours. As the ruins are situated deep inside a jungle, the wildlife sighting is quite common - at the very least you will be followed all around by a coatimundi or an ocellated turkey. Our trip ended after our magical day in Tikal. Guatemala is a fascinating country to visit and we are glad that we could at least scratch its surface before we move to the other side of the world. Hopefully, if our cunning plan to "drop our son with his eager grand parents and take off on a trip" materialises, the Asian section of this web site would start growing very soon! Click here for more photos from Guatemala.